JDC - Archives : A man and a woman examine page proofs. Search > Search Results > A man and a woman examine page proofs. Title A man and a woman examine page proofs. 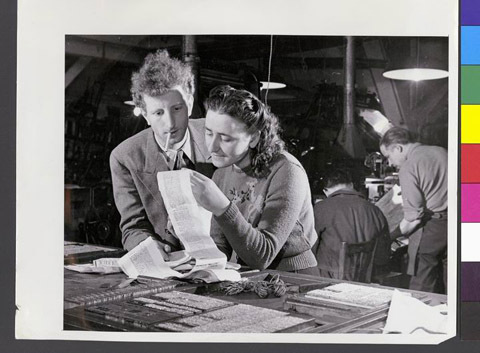 Description A man and a woman examining page proofs (with the type setting in the foreground) for the Jewish student newspaper Madimah. The profits of the newspaper helped fund the Union des Etudiants Juifs, or Union of Jewish Students, to help provide funds for learning. This printing program was part of a vocational training program for refugees, subventioned by JDC.